Among the people that lived in our house, we can name the Edler family. Inge & Karin Edler moved from Ystad in Villa Bellevue with their four children 1958 and left it 1974. Inge Edler was a cardiologist who worked at Lund University Hospital. 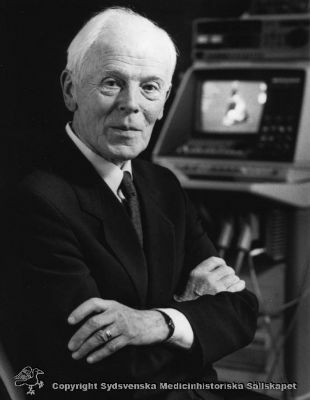 He was friend with Hellmuth Hertz and if he invented the ultrasounds, Inge Edler invented, instead, the ecocardiogram, which is used in ultrasounds for showing the heart activity. While Inge had his disputation party at Villa Bellevue, his wife Karin had her study in the house, since she was an ophtamologist. When they moved in the house, her oldest son, Anders, was already 18 and didn't live too much in Åkarp. The other three, instead, were the ones that grew up here and were the authors of the graffiti that we found in some of the bedroom. We had the pleasure to get in contact with Anders and invited him over. He told us about what he remembered of the house and some stories about his family (like for example they had some little work to do with all the apple trees as well). It was very interesting to have him over because he had quite good memories of how the house and the garden looked like. They spent almost half an year renovating the house before moving in. That included also putting new wallpaper almost everywhere. The "chauffeur" sofa in the hall was covered in red leather and was used by Karin's patients. There were no marble window sills but only wood ones. The radiator in the "tower" corner of one of the living rooms was substituted once, since the first one that was ordered had the wrong diameter and hence didn't fit in the space. In the kitchen there was a wall dividing the "kitchen" from a small corridor. In the kitchen the sink was placed by Inge's will as a little kitchen islands ("so that two people could do the dishes"). The veranda was very drafty or had some problems with isolation. The small toilet at the entrance was having white tiles and white floor. The same also for the bathroom at the second floor. He had no memory that in our most north placed bedroom there were a sink or anything similar. His room was first Isabella's room, then he moved into what is our guestroom, where there was not the built-in wardrobe. The garden was having much less trees and much more grass. Some of the trees we have today were planted then. The meridian was in the middle of the front lawn (now, it has been unfortunately hidden behind the garage). The hall was dividing in two rooms by a swing door (which luckily is still up in the attic). The name of the house was not visible on the facades. The only thing I am sad about is that he didn't have any pictures of the house. However, he promised that when he would scanned his slides pictures, he would share what he found of any relevance.